Women who experienced PMS or postpartum depression are more likely to experience mood swings during menopause. Not only can menopause prompt uncomfortable physical symptoms, but it can also turn a woman's emotions into a pendulum, prompting moderate to severe mood swings. Menopause is a time of significant hormonal changes, and these changes, typically occurring in women between the ages of 45 and 55, can affect emotional stability. More than 50% of women experience mood swings as they approach menopause. Fortunately, there are effective ways to manage menopausal mood swings. Continue reading to learn all about mood swings, their causes, risk factors, extreme cases, and treatment options. Mood swings are defined as extreme or abrupt fluctuations in mood. During mood swing episodes, people often experience drastic shifts in their emotional state. The term "mood swing" is often used to describe an emotional reaction that is inappropriate or disproportionate in relation to its cause or trigger. During menopause, women commonly experience mood swings because their hormones, which regulate mood and emotions, are thrown off balance. While this is a common and normal symptom of menopause, it can negatively impact your personal and professional relationships. It is often helpful for women going through mood swings to understand the symptoms of this condition. 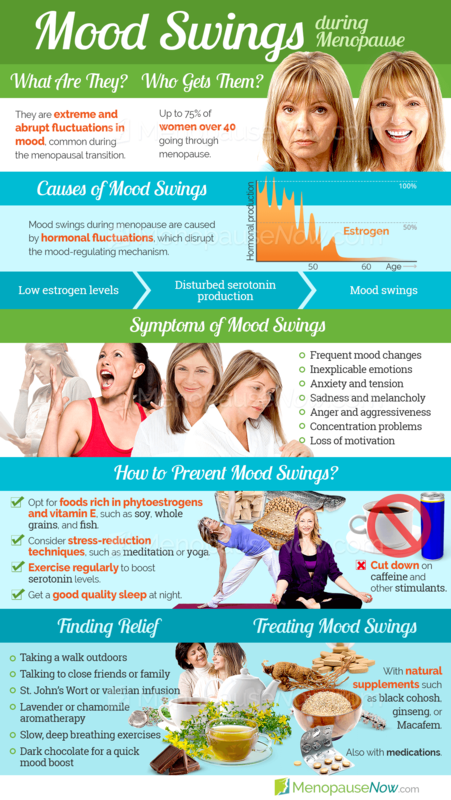 Keep reading to learn more about how mood swings can manifest during menopause. Because each woman has her own unique way of managing her emotions, stress, and her environment, all women experience the symptoms of mood swings differently. However, many symptoms of mood swings are common among women going through menopause. Up to 75% of women going through menopause suffer from mood swings. Being aware of these symptoms can help a woman develop a well-rounded perspective of mood swings. Click on the following link to read more about mood swings, or continue reading to learn about the causes of mood swings. It is not uncommon for women to experience occasional blues that go away within a few days and do not cause any disturbances. But sometimes lingering mood drops are triggered by hormonal imbalance or depression. Fortunately, they are ways to bring more stability to your emotional health with exercise, light therapy, or herbal supplements. Know what symptoms to look out for if you are prone to mood swings. Even if you were able to keep your emotional composure during premenstrual syndrome in the past, you may find it is not as easy during menopause. Find out what you should expect and why it's occurring. Mood swings during menopause are caused largely by the hormonal transitions women go through during this time. 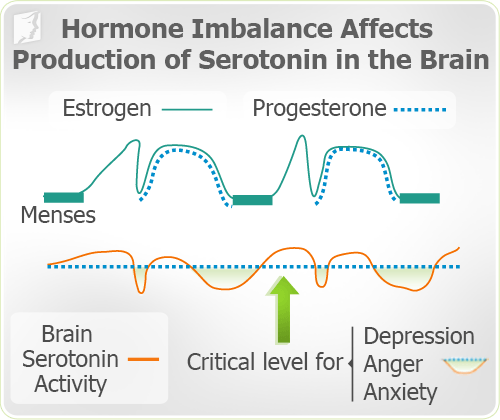 Hormones, such as estrogen, influence the production of serotonin, which is a mood-regulating neurotransmitter. However, there are other causes of mood swings. Other menopause symptoms - such as hot flashes, night sweats, physical changes, and fatigue - can cause or intensify mood swings, but these symptoms are generally caused by hormonal imbalance as well. Medical researchers have found that estrogen plays a major role in the brain's production of serotonin, meaning that estrogen has a hand in mood regulation. Because perimenopausal hormone imbalances temporarily disrupt serotonin production in the brain, there is an increased chance of mood swings, depression, and other psychological disturbances during menopause. While hormonal imbalance is thought to be a major underlying cause of mood swings during menopause, experts also point out that mood disturbances may be caused by other menopause symptoms. Keep reading to find out how other menopause symptoms can affect mood and emotions. Mood swings can be the result of other menopause symptoms. Women in their 40s and 50s, often stretched already by work and home stresses, suffer from fatigue, sleep problems, hot flashes, and other symptoms that can directly contribute to problems with mood and emotion. Click on the following link to read more about the causes of mood swings, or continue reading below to find out the risk factors for mood swings. Sudden changes in mood are product of an internal imbalance occurring within women. Whereas, normal mood swings could be caused by external factors, such as stress. Click here to learn more about the difference between both as well as why they occur and when you should start searching for help. Does Endometriosis Cause Mood Swings? Mood swings are a very common symptom of menopause, and they actually affect the majority of women at some point in their life. Find out how the pain condition endometriosis might play a role in these bursts of emotion, as well as what exactly is causing the pain. Why are some women more prone to mood swings during menopause? The answer has much to do with a woman's chemistry, her environment, and other factors. In addition to the hormonal causes of mood swings, several psychological, behavioral, and health-related factors can increase the likelihood that a woman will experience mood swings during menopause. Click on the following link to read more about risk factors for mood swings, or continue below to learn about extreme cases of mood swings and when to see a doctor. It never feels good to be stuck in wave after wave of negativity. You do not want to spend your days distracted by sadness or caught up in anger. This article explores common triggers that prompt mood swings and the best ways to avoid them. While mood swings are normal during menopause, emotional symptoms sometimes indicate a more serious condition. Mood swings that are extreme, last for an extended duration, or put a woman or others at risk of harm warrant professional help. To learn more about when to seek help for mood swings, read on for the symptoms of bipolar disorder, clinical depression, and anxiety. 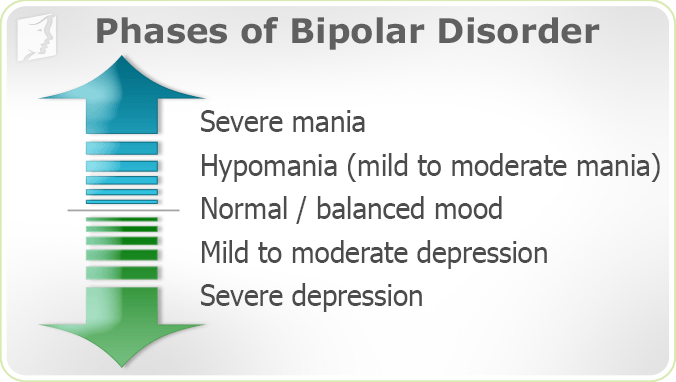 Bipolar disorder, also called manic-depressive disorder, is a group of mood disorders characterized by the presence of one or more episodes of mania, or abnormally elevated mood, and alternating episodes of depression, or prolonged low moods. Depression, termed major depressive disorder, is another condition more serious than mood swings for which professional help is often necessary. While many people experience the symptoms of depression at different times in their lives, clinical depression is more than a temporary state or a symptom of menopause. Anxiety is another condition more serious than menopause-induced mood swings. Anxiety disorders affect up to 18% of adults in the U.S., making this the most common type of mental illness. Clinical anxiety is a group of disorders and phobias. Fortunately, help is available for women who experience psychological conditions that are more serious than mood swings. Most women who go through menopause will not develop such symptoms. If you are concerned about mood swings or other symptoms during menopause, it is best to speak with a qualified health professional. Click on the following link to learn more about the extreme cases of mood swings, or continue reading to find out about the best treatment options available for mood swings. How Do I Cope with Extreme Mood Swings? Many menopausal women find themselves dealing with mood swings, some of which can be extreme. Fortunately, there are ways to cope with this symptom, which include changes in diet, exercise, and hydration. This article also helps women identify when they are suffering from extreme mood swings, or if they could be signs of depression. Many women can find that experiencing mood swings is an inevitable part of going through their menstrual cycle. This is often because the female body is having to deal with changes in hormone levels. For more information and advice on how to reduce the impact, read on. When exploring treatments for mood swings, it's important to begin with methods that are the least invasive, with the least likelihood of side effects, and progress from there. This means that lifestyle changes are typically the best place to begin. For instance, sometimes mood swings can be alleviated simply by getting enough sleep and maintaining a healthy diet rich in nutrients. Typically, combining lifestyle changes and alternative medicines produces the best treatment results. Alternative medicines include different herbs and supplements, as well as techniques like massage. When seeking an alternative method, keep in mind that mood swings during menopause are associated with hormonal imbalance. Look for supplements that balance hormonal levels naturally, which will go a long way in treating mood swings at the core of the issue. Finally, if you are still experiencing mood swings, there are different prescription medications that can be explored. Generally, this final option comes with the most risk and potential side effects. Click on the following link to learn specific treatments for mood swings, which begin with lifestyle changes, followed by alternative medicines, and finally, if those options don't seem to help, medication. The most effective treatments for mood swings typically combine lifestyle changes and alternative medicines. Many middle aged women suffer from angry moods during menopause, which cause a lot of disturbance in their life. However, many of them find that an optimal treatment for angry moods combines a few different approaches, such as being active, having a brain-healthy diet, practicing mindfulness, or taking mood-enhancing supplements. Mood swings are one of the most frequently reported symptoms during menopause. Medications prescribed to treat mood swings include the hormone replacement therapy, as well as less common mood stabilizers and anti-depressants. Each medication regimen has its pros and cons, so choosing the right medication for your needs is essential. Love, S. & Lindsey, K. (2003). Dr. Susan Love's Menopause and Hormone Book. New York: Three Rivers Press. 03/22/2019 Mood swing reactions range from anger to sadness to euphoria to irritability, causing women agony for weeks or months to come if left untreated. Discover the definition of mood swings as well as what you can do for help to finally stabilize your temperament here. 12/10/2018 Mood swings are common for women to endure as they progress throughout their reproductive lives, with them happening most often during the menopausal transition. On the other hand, constant mood swings are considered outside the realm of normality and should be addressed immediately. Discover more about frequent mood swings here. 04/03/2017 Understand what you are sacrificing by letting mood swings take over your life. Your health, happiness, and productivity should not be overrun by negative emotions. Understand exactly what it is that you are letting go of and how to refocus on what is important in life. 10/31/2016 Mood swings come and go abruptly and can have you feeling different emotions throughout the day. More rapid and intense mood swings are considered severe, at which point it is important to know the duration, symptoms, causes, treatment, and when to seek help. Read on to get answers to urgent questions about severe mood swings.